A light, fluffy accumulating snow will begin tomorrow afternoon and will continue into Wednesday. A wave of low pressure will pass through Southern New England triggering snow after 2 PM tomorrow. 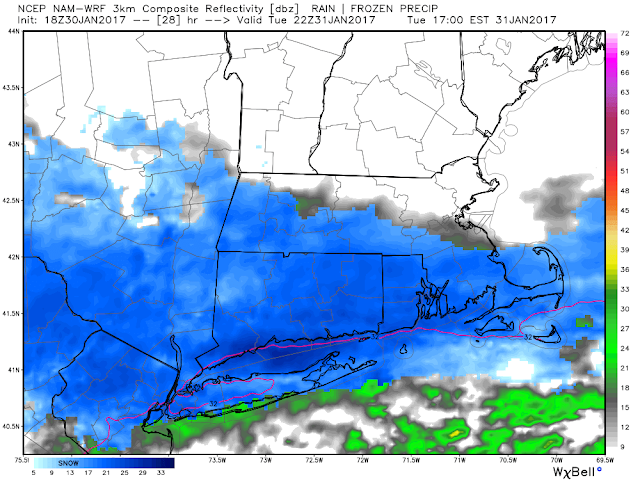 Tomorrow evening's commute will likely be slick and snowy especially in Worcester/Springfield/Hartford, but also creeping from Metrowest toward Boston. Light snow should continue through the Wednesday AM commute. Total accumulated snow will be 1-3" with perhaps a bit more at the coast. The National Weather Service has issued a *Winter Weather Advisory* for most of Southern New England from 11 AM Tuesday to 4 AM Wednesday. Here is a snap shot of the water vapor satellite with the surface fronts added. Skies overnight will be mostly clear as low pressure south and east of New England pulls away. Our storm is in the Midwest so it will take until tomorrow morning for the clouds to return. The clear sky tonight will allow for temperatures to plummet into the teens. Winds will be out of the west tonight gusting as high as 20-25 mph. Winds will eventually shift tomorrow afternoon to the Southeast as the low reaches Southern New England. Here is the projected surface chart as of 1 PM. At 1 PM temperatures will be in mid 20's. 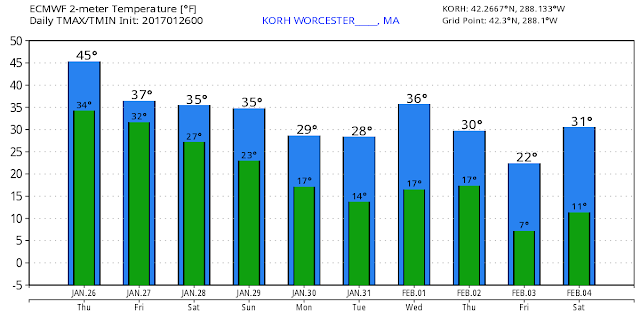 Temperatures will drop to low 20's in Western and Northern Worcester County during the event. Temperatures say in the 25-28 range in the Boston to Worcester to Hartford to Providence corridor. Snow begins after 1 PM but probably closer to 3 PM. 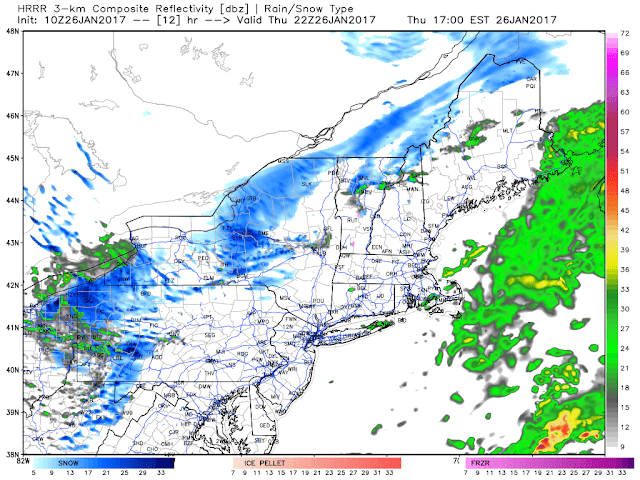 Here is the simulated radar for Tuesday 5 PM. Snow looks to be moderate until 9-10 PM when 1-3 inches will fall. Snow will lessen in intensity until around 2-3 AM when a secondary burst of snow is likely with another 1-3". I am not sure where this will set up yet, probably closer to Boston. Temperatures will begin to rise Wednesday AM as winds shift from the east to the southwest. Precipitation ends around 10 AM region-wide. Total snow accumulation is 2-4". Colder air returns for Thursday/Friday. 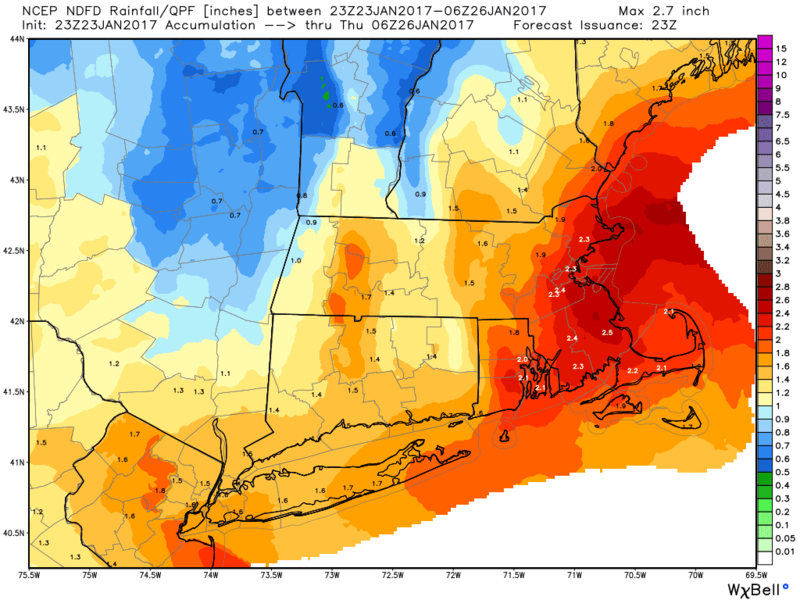 Adding 3-4" inches puts us right about average in Worcester and perhaps above average in Providence. 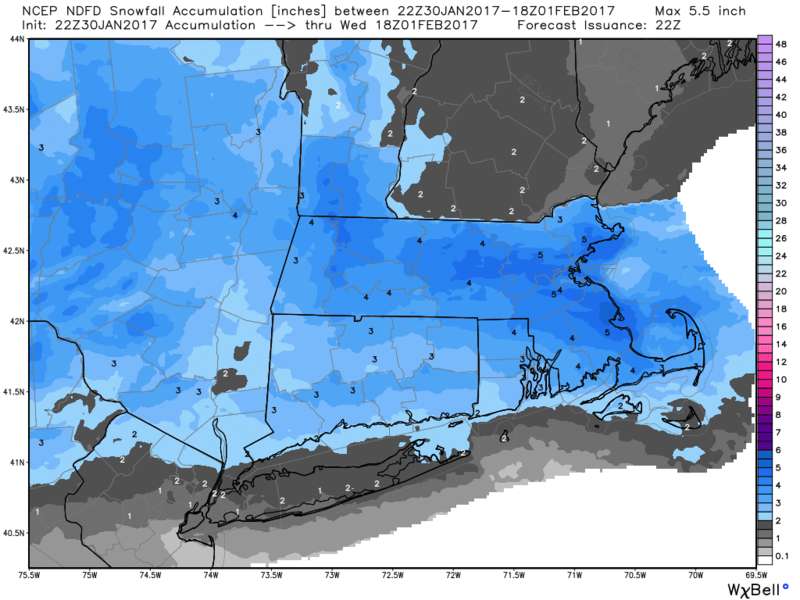 Boston is down but if Logan picks up 5" (possible) they are down 3" going into February which is the snowiest month in Southern New England. It has been a warm winter for sure. Above average in January is still cold. 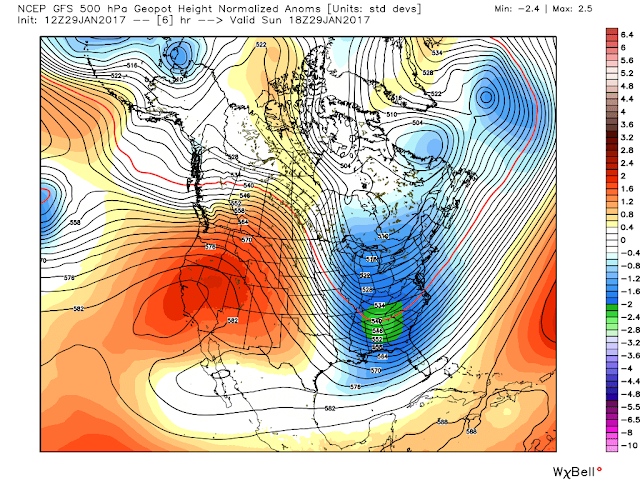 A few light snow events are likely this week as the pattern changes back towards a more typical early February pattern. The upper air pattern has changed but surface temperatures have remained above normal. This begins to change tonight when a cold front from Canada brings a shot of Arctic air. 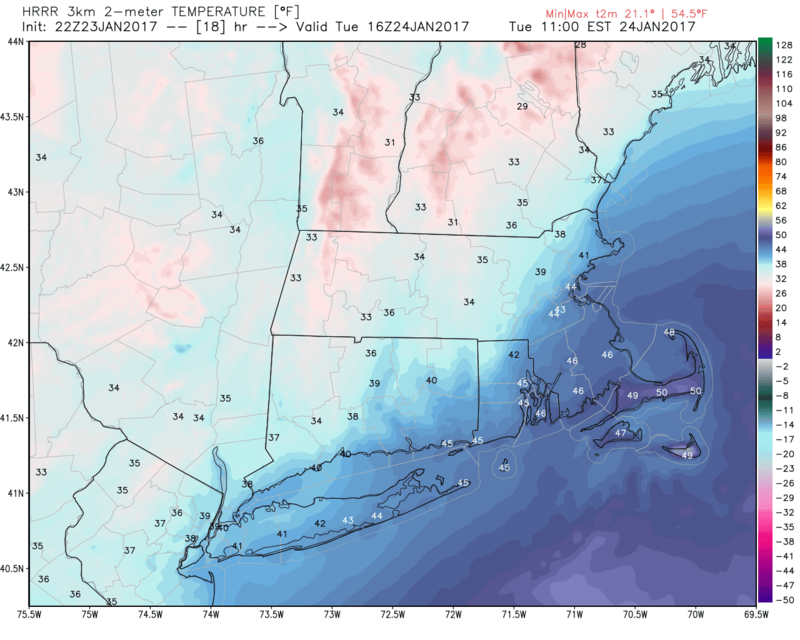 The coldest air remains in Northern New England but temperatures in the upper 40's appear to be the exception, not the rule going forward. The surface chart as of 8 AM shows the Arctic boundary beginning to enter the Great Lakes. 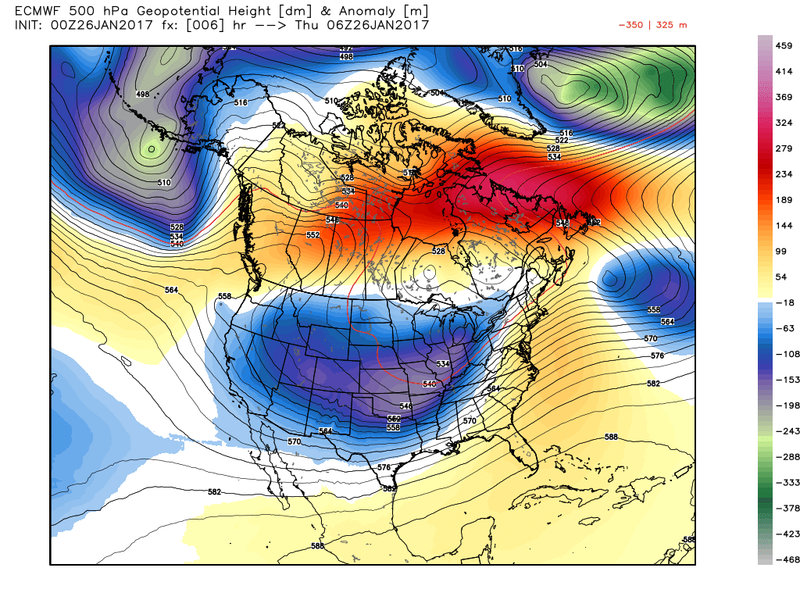 A powerful dome of high pressure has built in the Western US. Here is the 12 PM forecast for the entire US. 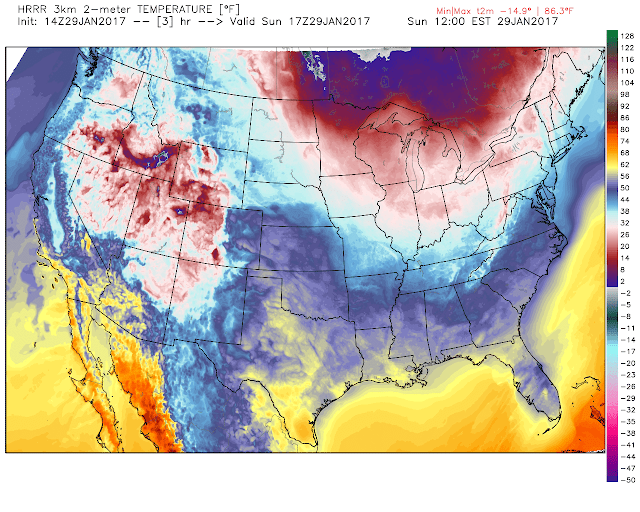 Notice the coldest air behind that cold front in Canada. 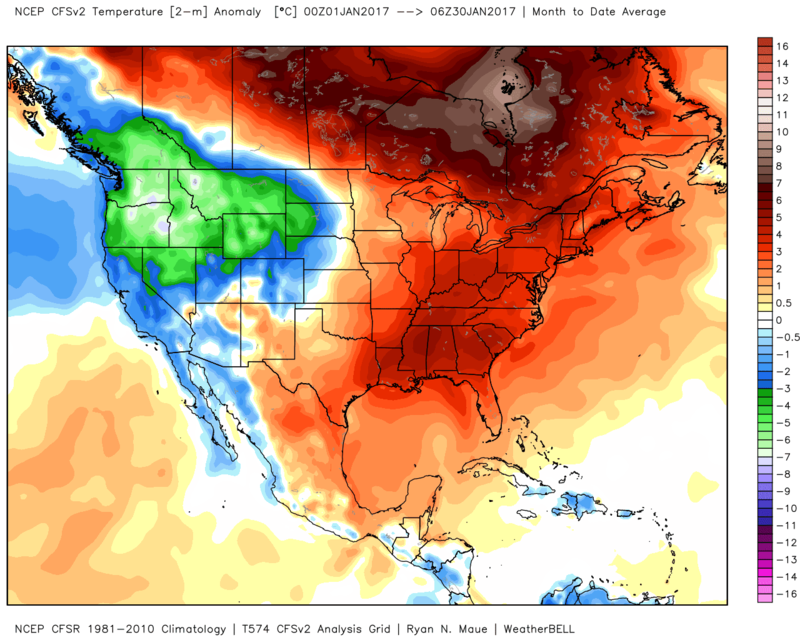 National temperature anomalies show below average temperatures under the high in the west and in parts of the Eastern US. 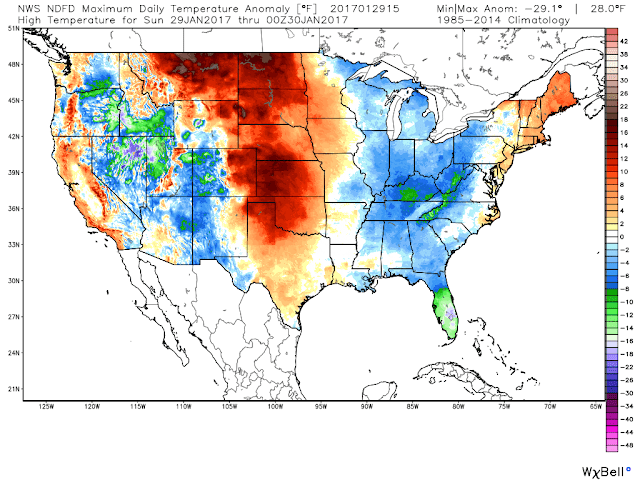 It is warm in the Central US and along the immediate West Coast. Pacific air is being forced up and over the dome of high pressure in the west and then down the Eastern slopes of the Rockies into the Plains. The water vapor satellite shows storm systems moving into the Pacific Northwest and down into the Plains. It also shows clouds ripping across South Florida. As the Arctic boundary sags south it will fall apart. Clouds will increase this afternoon with a slight chance of a snow shower. Winds will be out of the west and shift to the northwest later today. Temperatures begin to fall this evening. Low temps drop into the low 20's. Max temperatures Monday are in the low to mid 30's. I expect more clouds than the sun as an area of low pressure will pass South and East of New England. A few snow showers are possible for the Cape and Islands. Temperatures will drop into the teens Monday night into Tuesday. A period of snow is likely on Tuesday as a clipper moves through the region. 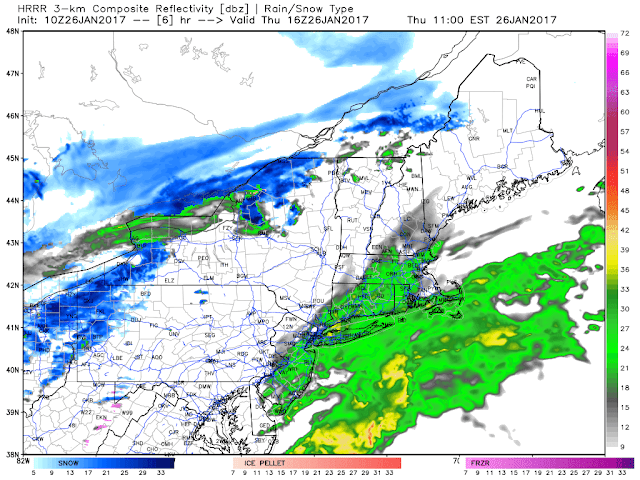 Precipitation should begin after 7 AM. School closings/delays do not appear likely. Expect max temperatures in the mid to upper 20's on Tuesday. Light accumulations expected. I'll update tomorrow. A frontal system will move into the Atlantic Ocean today bringing an end to the seasonably warm temperatures we have experienced so far in January. 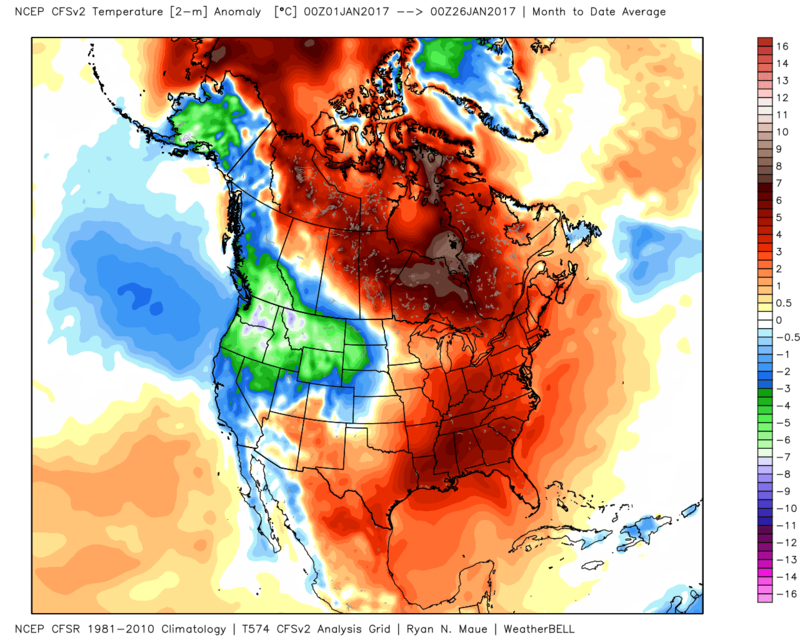 The endless parade of storms into the Western US is keeping the Pacific Coast/Northwest much cooler than normal. This front will feature some rain showers as it passes. Currently, there are numerous showers throughout the Northeast as the warm front pushes Northeast. The trailing cold front is not far behind. This system has turned the lake effect snow machine back on after a lull in the Great Lakes. Most of the US will feature below average temperatures today. The major exception is the east coast. 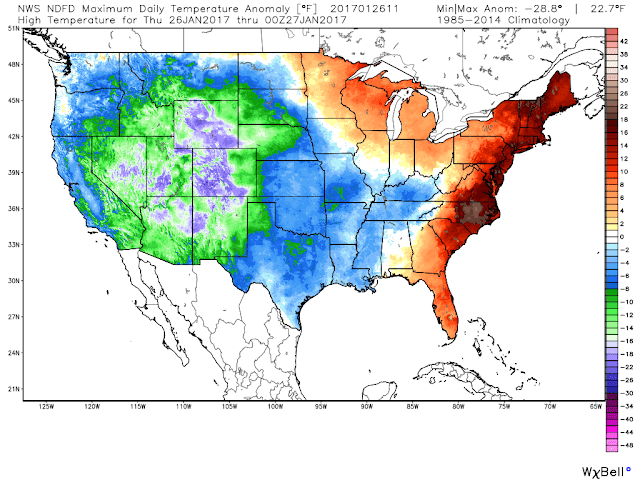 Temperature anomalies for the lower 48 show temperatures running nearly 30 (F) below normal in the west and 23 (F) above normal in the Mid-Atlantic/Northeast. 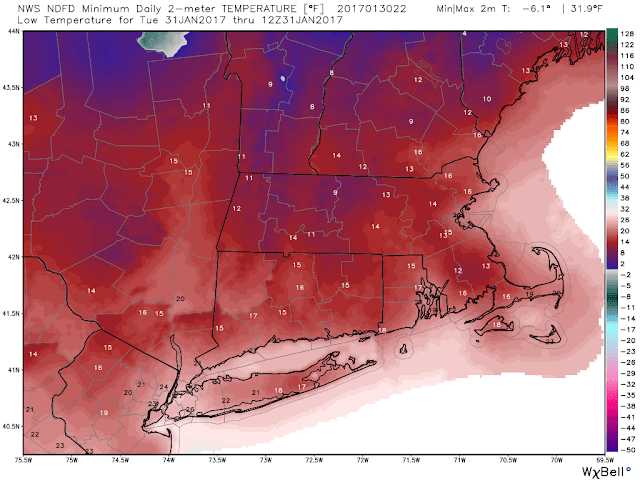 This translates to max temps in the upper 40's/low 50's in Southern New England. The threat of precipitation exists this morning until late afternoon. At 11 AM widespread showers are likely across the region. By 5 PM just a few isolated showers remain. The evening commute will feature wet roads but temperatures will still be in the upper 30's/low 40's as rush hour begins. Here is the water vapor satellite of the whole US this morning. If you want to follow the cloud trail of the frontal system that will deliver our precipitation today notice that it originates in the Pacific Ocean. Typically when we see a warm winter in Southern New England the source air mass is the Pacific Ocean. This will change with the new upper air pattern. This upper-level trough (in blue/yellow/green) will slowly settle over the east coast the next several days. Temperatures will drop at/below normal temperature values for late Jan/early Feb. Tonight is down to around 30. It will get much colder according to guidance. Not bitterly cold, but cold enough and much colder than the past few weeks, High temps aren't all that terrible as we go into Feb.
Small chance of rain/snow showers tomorrow but otherwise dry for the rest of the weekend. It has been snowing off/on all day in portions of Southern New England. 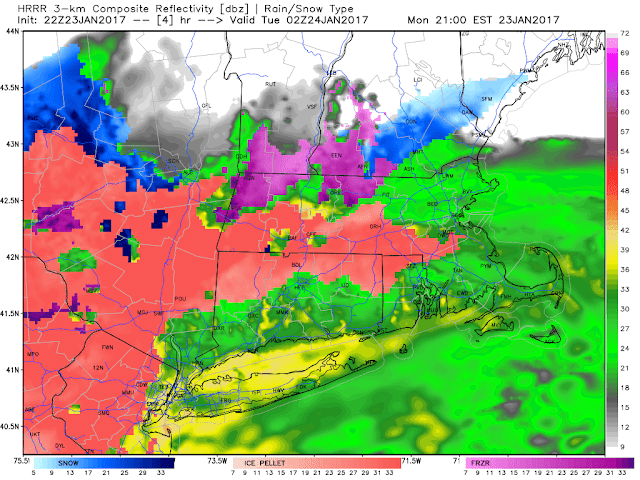 This will transition to rain and sleet tonight, mainly north and west of Boston. There is a *Winter Weather Advisory* for these areas. In Eastern MA and RI a *Flood Watch* has been issued. A *Wind Advisory* is in effect for Eastern MA, RI, CT, and Hampden and Worcester Counties. Expect a wet and slow Tuesday AM commute. She sure is a looker on satellite. There is moisture being pulled north from the tropics aiding the small stream/urban flood threat in Eastern MA/RI. The broad but strong surface low is running into high pressure in Quebec. The upper-level system is also large so a wide band of intense precipitation is making its way into Southern New England while the surface center is hundreds of miles south. Here is the Northeast Regional Radar. The temperature profile suggests rain will switch to sleet and freezing rain in Essex, Middlesex, Southern Worcester, and Hampden Counties. Temperatures in the throughout the atmosphere support all rain in Eastern MA/RI. Here is a snap shot of the radar at 9 PM. I expect the showers to increase in the afternoon. This is more likely in Eastern MA and RI. The winds will gust 35-45 mph for interior Southern New England and 50-60 mph on the Cape and Island's. Temperatures are near freezing through the morning in Worcester County. In Eastern MA/RI temps are in the 40's to near 50! The NFL is fortunate that the NFC Championship will be played in a dome this afternoon. Many Atlanta Falcons fans and football fans, in general, will be at risk watching the game in the Southeast today. Low pressure is rapidly strengthening along a surface boundary near the FL/GA line. It will be difficult to get your shine on or cruise this afternoon. Numerous severe thunderstorms are expected to develop this afternoon and evening as the low continues to intensify. These thunderstorms will be capable of producing large hail, damaging winds, and strong tornadoes. This is the same storm system that will bring 1-3" of rain and strong winds to New England Monday-Tuesday. There are some showers around New England today but these are not associated with the Southern storm. A cold front is dropping into the region from the North and East, almost in a backdoor fashion. The second half of the game will likely see a passing shower or two as the boundary of cold dry air meets low-level air that is warm and moist (seasonably). 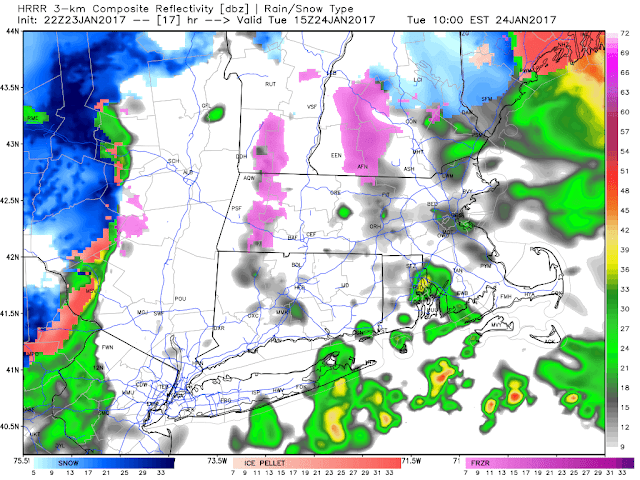 The cold dry will turn some rain over to snow north of the MA Pike and into S NH/VT. The Storm Prediction Center (SPC) has a large area of the Southeast under a High Risk for severe weather including strong tornadoes (EF2 or greater). The Southeast Regional radar is a sight to behold this afternoon. So far the rain is south of the Georgia Dome for fans traveling to the game/tailgating. The surface low is developing near the MS/AL line. It will track northeast into GA between 6-7 PM. 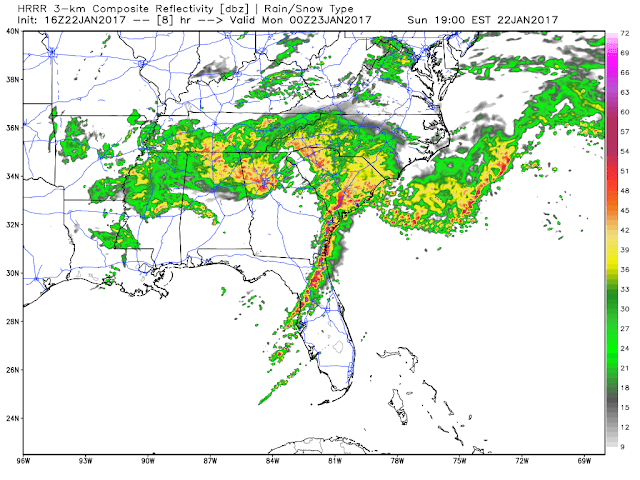 The center will cross near Atlanta around 7 PM. A ton of rain is going to fall in the Atlanta metro area. Here is the simulated radar at 7 PM this evening. 2-5" of rain isn't out of the question in Northern GA to go along with the wind, hail, and tornado threat in SC/S GA/N FL. Certainly, much calmer weather in New England but the game is outside exposing everyone at the game directly to the elements. Here is the surface chart as of 7 PM. There will be some rain showers around the region but the coverage is isolated until around 8-9 PM. Widespread shower activity is expected near the frontal boundary. Gillette Stadium is near the southern edge of the rainfall. Some snow in Northern Worcester County so if traveling for the game please be careful as it will be slick. Here is my bi-hourly forecast for the Pats game tonight. Let's go!!!!!!!! Here is a recap of the 12 previous times the Patriots played in the AFC Championship Game if you want to kill some time before kickoff. I don't have many changes to my blog from yesterday. The National Weather Service has a great briefing here. Temperatures will dip to the upper 20's/low 30's north of the Pike tonight. It will be slick in the AM on untreated surfaces. As heavy precipitation begins later tomorrow evening a period of sleet, snow, and freezing rain is possible south of the Pike as well but it will quickly go over to rain. Most areas up to 495 and route 2 will go over to rain quickly. 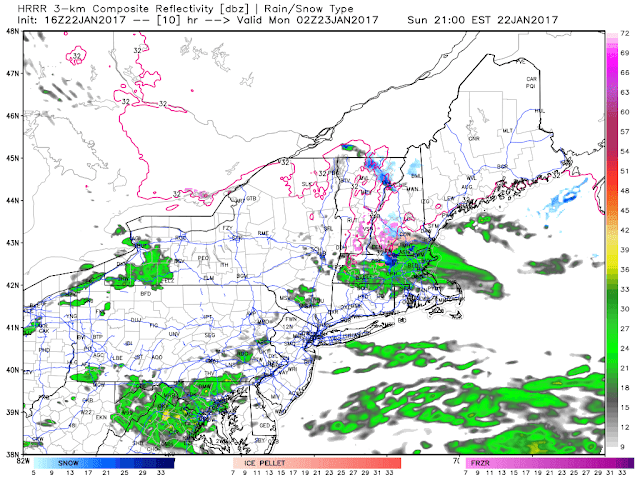 Portions of Western MA will see a mess of a storm with all types of precipitation. The absolute latest on the Monday storm in the AM. One update I do have is I now expect 2-4" of rain. The NWS has issued a *Flood Watch* for Eastern MA and RI. I feel this should be extended to S Worcester County. It may at a later update. Today marks the 13th time the New England Patriots will compete for Lamar Hunt Trophy and a right to represent the AFC in the Super Bowl for a record 9th time. Pittsburgh is making a record 16th appearance in the AFC Championship Game and they are also looking a record 9th Super Bowl berth. These two franchises have combined to represent the AFC 11 times since 1995. Throw in Denver and the Pats, Broncos, and Steelers have combined for 15 AFC titles and 9 titles since 1995. Thanks to the NWS NOWData and Pro Football Focus for the information.